UPDATED: Thu., Sept. 7, 2017, 3:02 p.m. The owners of Beacon Cleaners are perplexed. 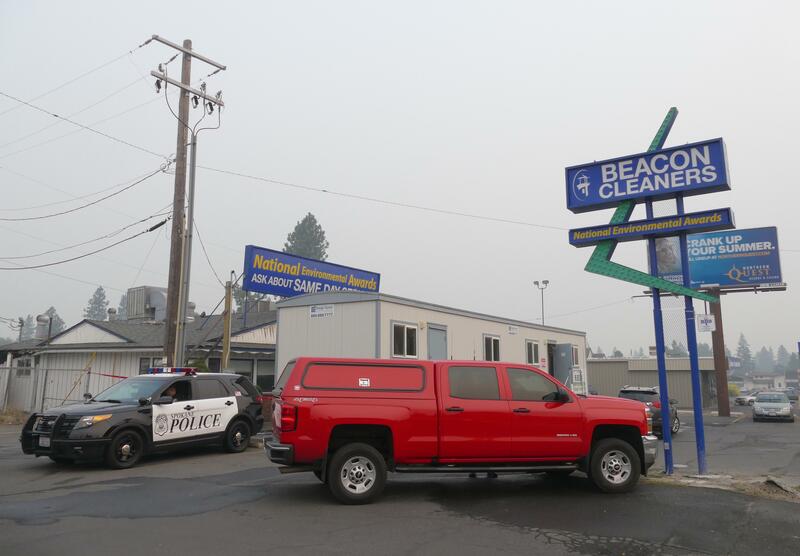 For the second time in less than a month, their dry cleaning store and laundromat on Spokane’s South Hill has been intentionally set on fire. The first one, on Aug. 11, ravaged the building’s attic and caused a serious injury to a firefighter when he fell off of a ladder. The most recent incident, which happened Thursday morning at around 5:45 a.m., involved a trailer the owners had set up in the parking lot, a bush and a power pole, and the back of the original building. As to why anyone would target their building specifically, Johnson had no idea. Johnson said business was operating as normal Thursday. But due to the damage to the pole, their credit card machine wasn’t working, though he said most of their customers are regulars, so he was fine putting their bill on a tab. Spokane Fire Chief Brian Schaeffer said investigators are treating the cause of the fire as arson. Schaeffer said Thursday that the firefighter who was injured when he fell off the ladder last month while wearing full gear, including an air tank strapped to his back, recently had surgery and was recovering at home. Published: Sept. 7, 2017, 11:53 a.m. Updated: Sept. 7, 2017, 3:02 p.m.